Moving to a new home meant building a new chicken run. 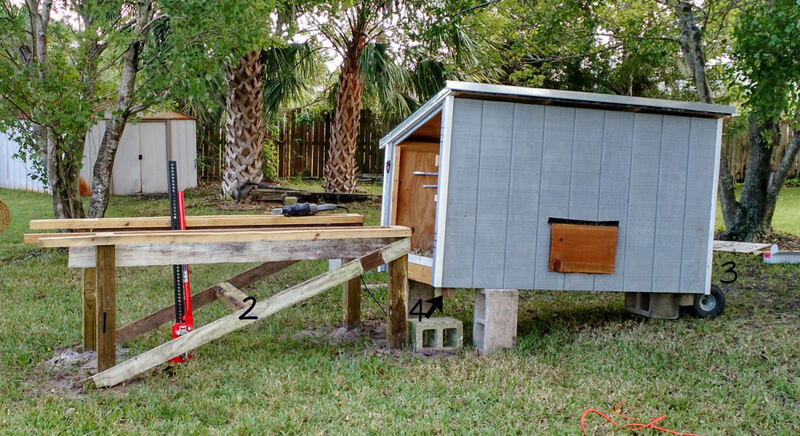 The coop was more expensive to build than I thought it would be, and it was still fairly new so I had my heart set on bringing it with us. Boy did it not take long for me to regret that decision. We chopped off the Coop at the 4x4s so there was about 3-4″ left on each. Getting it on the bed of the car was the easy part. Eric backed up the truck to the coop and we slid the coop in. We weren’t really sure how we were going to get the coop set up. But first we figured we should at least get it nearby to where we wanted it to permanently be. Well, that spot was behind the hill (septic tank) and past the soggy mudpit (it was right in the middle of the rainy season here). We thought Eric could just drive it on over. Nope. Nope.Got it stuck in the mud and spent lots of time and heartache getting it out.Long story short, we found someone with some come-along and got the thing out. We Couldn’t lift the coop (well, I couldn’t even get my half of it off the ground) and just move it over to it’s new spot. After a lot of brainpower, we moved it over to its new spot with my half on a dolly and Eric pushing the other end. It was surprisingly (relatively) easy to move it that way! After moving it to it’s approximate permanent location, we propped the coop up on some cinder blocks while we thought about the next steps. During that time, Hurricane Matthew, a Cat 4 hurricane decided that it’s been too long since our side of Florida has seen a hurricane. Great. So the Chicken Run Project got delayed even more due to more pressing matters of Hurricane After-math Cleanup. Anyway, eventually, we got the 4x4s in the ground! It was tricky, getting them to be just in the right spot so that when the old coop 4x4s would match up just right, but all we did was measure. Eric cut off the “stub” 4x4s from the coop, and built a frame around the 4x4s in the ground so that we could slide the coop on without ruining our posts. So the idea was that we would slide the coop on, and use giant lag bolts through the remainder 4×4 that we couldn’t pry off and through to the post in the ground. That probably doesn’t make sense. Here’s a picture to capture our task. These are our 4x4s in the ground and cut to the appropriate heights so that when the Coop is on, it is level. We were on a hill so it was tricky getting it just right. This is the frame structure Eric built to give stability and strength to our posts while we slide the coop on. Just wanted to point out how the Dolly was used to move the coop this whole time. We had to prop the coop on a Cinder block to get the right height. The “Stubs” I was referring to earlier that were cut flush with the bottom of the coop before sliding it on the new posts. TADA! Thank goodness. It seemed so high off the ground at first, But I like it so much better. Much easier to clean up in there. In order for a structure to pass inspection, it must pass the Eric Test: if you can dance on it, it is structurally sound and is allowed to stay. We put six 4×4 posts in the ground for the run and used 2x4s for framing pieces along the top and for the door. We used metal brackets (like THESE) to nail the 2x4s in place. This time, The run is 6′ tall so I can walk in easily to clean up/rake. Last time, it was 36″ tall which was easier on the wallet but harder on my back when it came to cleaning up inside. Here you can see the two types of mesh we used. 36″ tall Hardware cloth on the bottom (with about 6″ buried in the ground) and 2″x2″ Woven Wire mesh (which we had to purchase from Agrisupply because we couldn’t find it at any of our local hardware stores) for the top. The reason for going with the 2×2 is just because the hardware cloth is too expensive to cover the whole thing with. The Door is made entirely with Hardware Cloth and I had specific requests for the door this time. Last time, I was not around when the Door-Design & Installation was taking place and I was not a big fan. You see, Eric thinks about things from a purely Structure Perspective. Will it be Strong? Will it hold up long term? Will it keep water out? And while those are important questions sure, I think about things from a Practicality & User-friendly Perspective. I want things to be easy to use to make daily tasks easier. Usually we have to compromise. I wanted a door I could open and NOT let the chickens run out, so I wanted a door that swung like this. (As opposed to opening at the bottom and hinging upwards). According to Eric, this is prone to sagging, and it’s somewhat “weak,” so he installed the corner brackets to add some long-term stability. So happy to finally be able to be out of the coop all day! Thank goodness that project is complete. I like where we located the run/coop. We were working in the rainy season which was a pain for the car, But it helped us see where the driest part of the yard was. Turns out my original spot was a mucky mess when it rained. Also, I get to see them outside when I look out the window while I’m doing dishes. Phew, that was a long post. It’s a funny story now, I guess. But also an important lesson. Next time, sell the house with the coop. And build a new one at the new house.